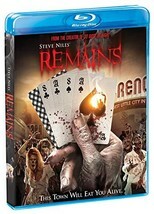 Based on the IDW Publishing graphic novel written by Steve Niles (30 Days Of Night), Remains is set in a chilling post apocalyptic Reno, Nevada, and follows the survivors of a bizarre accident that reduced most of the world’s population to zombies. The group takes refuge in a vacant casino and fights a losing battle against the undead, who grow steadily stronger, smarter and more aggressive by the minute. The movie stars Grant Bowler (Killer Elite, True Blood), Lance Reddick (Fringe, Lost, The Wire), Miko Hughes (Pet Sematary) and Tawny Cypress (Rescue Me, Heroes).